Life has been total chaos lately, and I’ve been kind of a total failure at doing anything but traveling, getting my family healthy from various ailments and delivering my children back to their teachers to nurture and educate so I don’t have to every second of every day (who am I kidding, they’re lucky to get fed and sheltered, much less nurtured and educated during the summer). So of course my cooking and photographing of new food has totally fallen off the wagon in favor of mere survival. I did, however, get an new issue of Everyday Food a couple of weeks ago and I was finally able to thumb through it this week when I was planning my meals. Of course Martha and her crew did it again and I found several spectacular and easy looking new meals I had to try. Did I mention that I attended BlogHer ’12 a month ago and saw Ms. Stewart speak in person? I know, right? I’m kind of a big deal like that, that I just get to see major celebrities speak. I’ve never been a huge Martha follower in the past. I don’t care for decorating my house with the changing seasons (sorry, that wasn’t really strongly worded enough, I CAN’T STAND decorating my house for the changing seasons) and I’m sort of meh on ‘good things’. But my mother-in-law got me a subscription to Everyday Food years ago and I continue to get it because honestly the recipes are consistently amazing and fast and easy (joke about girl my father dated redacted because EW, Dad). But hearing the big MS speak kind of won me over. I sort of love that despite her foofy crafts and commitment to everything traditionally housewifey, she’s at heart a badass business woman who will cut you if you get in her way. So the point of all of this is, today’s recipe was just as awesome as expected. And I’m officially getting back up on top of life. Pretty soon. Any second. And don’t cross Martha. Slice one lemon thinly. Zest second lemon into the flour (stir to mix) and then cut in half and juice. Set aside the juice. 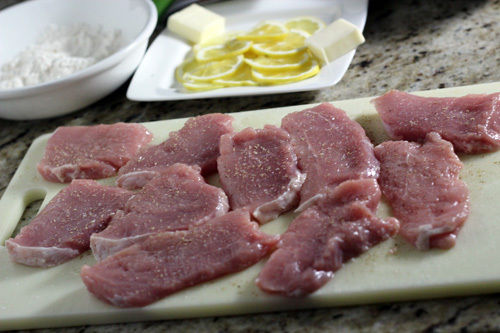 Lay the slices of pork out on a cutting board and cover with plastic wrap. Pound to 1/4 inch thickness with a meat mallet. Salt and pepper both sides of pork slices. Melt one tablespoon of the butter and one tablespoon of olive oil on medium (if you have a large gas burner) or medium high (for electric or a small gas burner) in a large skillet. Working in two batches, coat each piece of pork in the flour/lemon zest mixture and then brown each side. 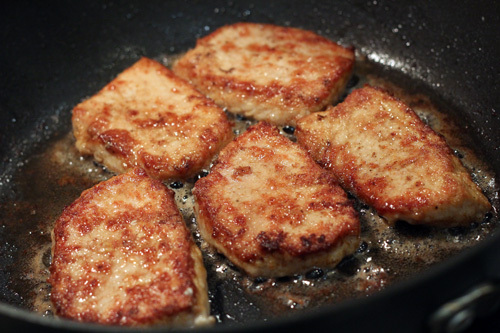 Pork should be cooked through when both sides are browned, but cut a piece to check for pinkness. Set all cooked pork on a plate and cover loosely with tinfoil to keep warm. 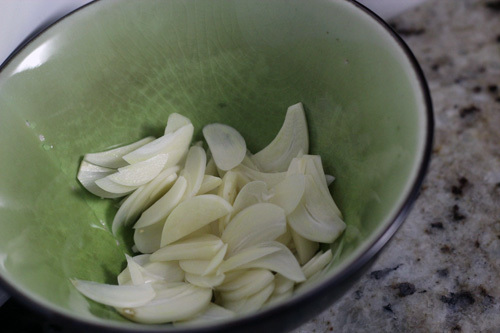 Turn down the heat a bit and add remaining tablespoon of butter and the sliced garlic. Sautee for about a minute. Add broth and simmer until reduced by about half (4 minutes). 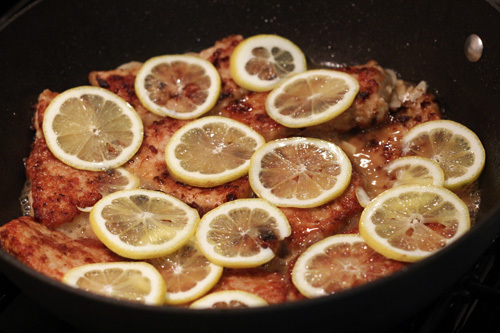 Return pork to the pan and top with lemon slices. Simmer another 2 minutes. 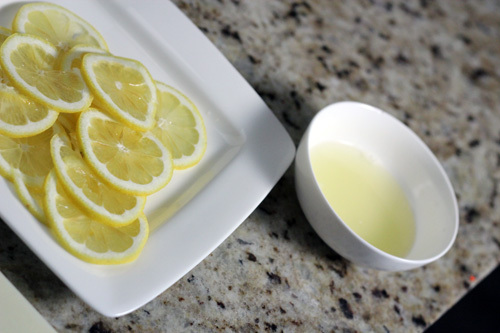 Turn off the heat, add lemon juice and stir to coat. 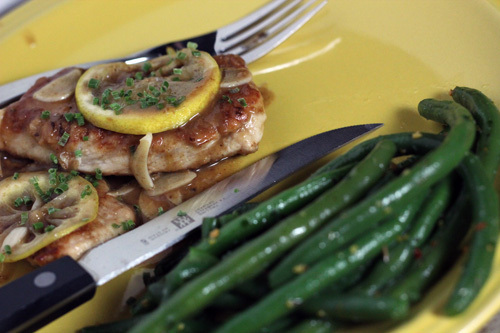 Serve topped with lemon slices and garlic and spoon over sauce. Finish with chives. This entry was posted in 5 Wine Glasses, Dinner, Pork. Bookmark the permalink. You’ll never be able to see the phrase “fast and easy” again without thinking about that joke. You are welcome. Also, that dish looks delicious. Do you think I can use chicken? This dish looks amazing!